Cel Damage Overdrive is one of the latest games from relatively new publishers Play It and features some of the best cel-shading on the PlayStation 2. The graphics of Cel Damage Overdrive are extremely reminiscent of Warner Bros cartoon shows such as Bugs Bunny and Daffy Duck. With three different types of gameplay modes that include capture the flag, gate relay race and smack attack modes, this game may have something for everyone. My first reaction to the game was one of bewilderment as I couldn't quite understand what this game was really about it. 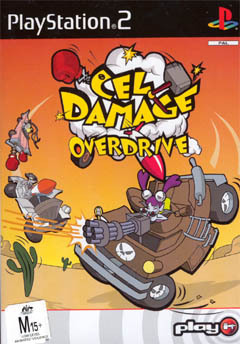 Cel Damage Overdrive seemed like a standard arcade racing car game and I must admit that the single player modes were a little left to be desired. However, as I played the game, I soon realized that this game was a sleeping beauty just ready to be wakened up. The multiplayer mode of Cel Damage Overdrive is brilliant and we had four players playing all at once for some great party action. 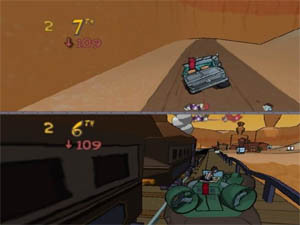 Once a player (or players) have selected the characters they wish to play, they must then choose which type of racing mode they wish to engage in. The Smack attack mode is basically a combat match mode that challenges players against each other. For instance, the more you attack a person, the more points you will receive and the person with the most points at the end of the level will win the race. The Gate Relay is basically a checkpoint race that has players racing through checkpoints until they complete a set number of laps, the first person to complete the race wins. 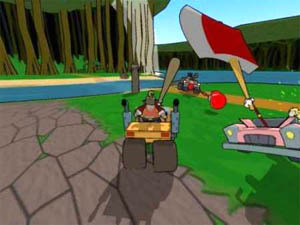 Whereas Flag Rally has players driving around the gaming environment to collect flags and take them to the Winner's Circle. By taking these flags to the Winner's Circle, they are then converted to points and whoever has the most points at the end of the level wins. This may all sound simple and basic but the fun really starts to happen when you starting attacking fellow players or opponents. 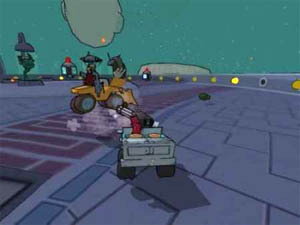 Players can ram into each others cars or find weapons and powerups all over the race course. My favourite weapon of choice is the baseball bat that allows you to knock players for six. There are over 36 different weapons that are available to player such as bats and bombs. The single player mode of Cel Damage Overdrive is a little boring at first as most of the races are fairly stock standard. One warning though, do not play the game on the easiest mode because I was lapping my opponents by almost two or three laps at the end of the race. The other two difficulty levels are somewhat more challenging and the more races you complete, the more events the game will unlock for you. Graphically, Cel Damage Overdrive is an extremely nice game that feature some great cel-shading graphics that helps make this game resemble a Warner Bros cartoon show. The graphics are sharp, colour and quite simplistic as are most cartoon shows are, whiel the backgrounds are extremely well animated and you almost expect the Road Runner to race out of one of the canyons you are racing in. There are variety of different playing environments that range from deserts, canyons, moon bases and monster swamps that allow for a total of over 13 different and interactive cartoon worlds. The game also has some great shadow effects from all objects in the game, whether cars or obstacles and some entertaining lighting effects. I should also mention that the game starts with a beautifully orchestrated cinematic of one of the most popular cartoon demolition derby's on the Toon TV network (this is of course fake) but it helps get the atmosphere of the game rolling and is a basic history of the game itself. The graphics also run at a perfected 60 frames per second for some of the smoothest racing ever. The sound effects of Cel Damage Overdrive sound like a Saturday morning cartoon show and you hear all the tweaks, squeals, bops and bounces that you would expect to hear. The voice acting of all the characters is quite overtop but it really does suit this cartoon orientated game. The musical score of the game is a little simplistic at the best of times but don't be surprised if you find yourself bopping along to the tunes of the game. In conclusion, Cel Damage Overdrive may not be everyone's cup of tea because of the simplistic graphics or limited gameplay modes but if you are looking for a great party game, then this game just might be it. With an affordable price, cute cartoony graphics and bizarre and whacky characters, Cel Damage Overdrive is ideal for little and big kids!